Pantry pasta is a fulfilling, dependable dish. You take staples like spaghetti, garlic, olive oil, and dried hot chile flakes and fuse them into quick, easy sustenance. Trouble is, those standbys occasionally swerve into a meal so boring my eyes loll back into my skull. We all need a jolt sometimes, right? 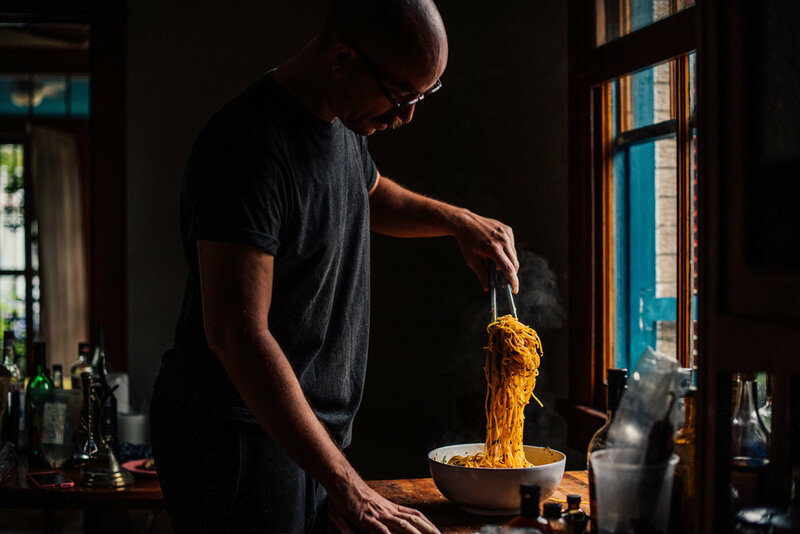 A few years ago, a recipe in Pati’s Mexican Table capsized what had become my ingrained method of cooking pasta with garlic and olive oil. I was intrigued by the recipes in Pati Jinich’s book—a combination of homey Mexican dishes, like pinto bean soup and chilaquiles in red salsa, alongside gently Mexicanized American classics, such as chipotle mashed potatoes and roast turkey marinated with citrus and achiote paste. Jinich’s cooking is a reminder to readers that borders are fluid. Ingredients and techniques cross nations and continents; people do the same. That kind of thinking—and cooking—is a humanizing beacon during these discouraging times, when the hopeful essence of the United States’ potential seems to be in jeopardy. 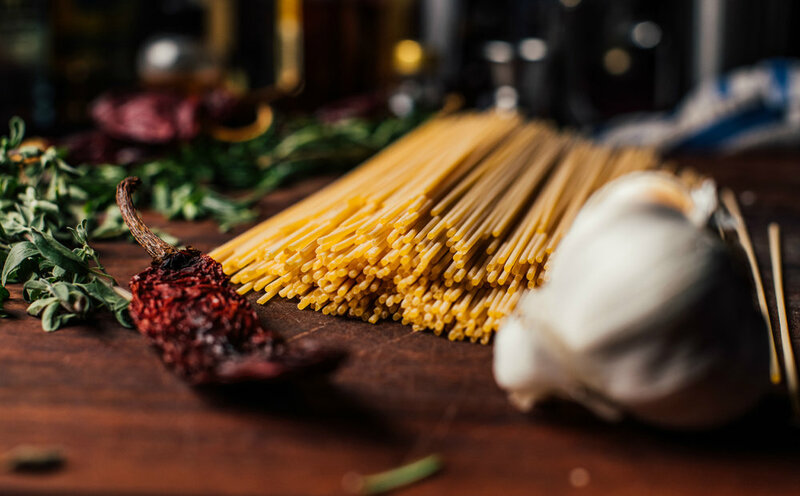 Jinich’s own recipe for pasta with garlic and olive oil features two simple, profound additions: mild, fruity dried Mexican chiles and strong fresh herbs. Her tangles of spaghetti breathe with a kind of worldliness. It is as if they have taken a sabbatical across central and northern Mexico, acquiring an obsession with guajillo chiles and oregano during their wanderings. There is flexibility to nearly every component of the dish. The original recipe asks for guajillos, those gentle dried chiles that are one of the most common dried chiles in Mexico. You could also use dried New Mexican or Californian chiles. I have. On the page, Jinich calls for a small handful of big-flavored, chopped fresh herbs: rosemary, thyme, oregano, and marjoram. I have used a different permutation each time I make this pasta. Sometimes two of the four, and always in varying proportions. I insist on marjoram being there. Because I am a marjoram obsessive. Your blueprint: Use at least two different herbs. From there, the ratio is yours. Only mildly interested in rosemary? Use less of it and more of the others. You get the idea. The cooking itself is seamless. First you add the pasta to salted boiling water. You then warm olive oil until it ripples, and add chopped garlic. In seconds, when the scent of garlic becomes incontrovertible, you toss in finely chopped dried chiles. Suddenly, the smell shifts from hot and garlicky to warm and chile-fruity. Quickly, the chopped herbs go in; the air blooms with musk and pine and sweet greenness. The drained noodles and a gurgle of pasta cooking water are slipped into the skillet and the lot is tossed until a slippery sauce coats the pasta. If you like, add a grated salty cheese. Pecorino, Cotija, Parmesan. One in that vein. Add some chopped parsley, too, if you want more verdant lift. The result: Italian at the core; Mexican in spirit. Some might call it fusion. I call it smart, modern cooking. The precise type of dried chiles in this handy dish doesn’t matter, provided you’ve selected a chile that is mild. You could even use a combination of mild chiles if you happen to have more than one on hand. Same goes for the herbs. You want sturdy herbs like the ones listed. But you could use only one, rather than having to source all four. Bring water to a boil in a large pot and add enough salt so it’s almost as salty as the sea when it comes to a boil. Add the pasta to the boiling water and cook, stirring occasionally, until a little less than al dente. Meanwhile, heat the olive oil over medium heat in a very large skillet big enough to hold the pasta. Add the garlic and cook just until fragrant, about 20 seconds. Don’t let it burn! Add the chiles and cook for another 20 seconds or so. Again, when they’re fragrant, move on to the next step. Add the herbs and cook yet again for 20 seconds or so. If the pasta isn’t ready yet, turn the heat to very low. You’ll want to reserve some of the starchy cooking water, so strain the noodles into a colander set over a mug or measuring cup. Add the pasta to the skillet, increase the heat back to medium, and add about ½ cup pasta cooking water. Cook, tossing, for another couple minutes, adding more cooking water if needed, until the pasta is al dente and slicked with sauce. Season to taste with pepper. You probably won’t need more salt, especially if you’re adding cheese. Toss with the cheese and parsley, if using either or both. Serve either family style on one large plate or divide among individual plates.